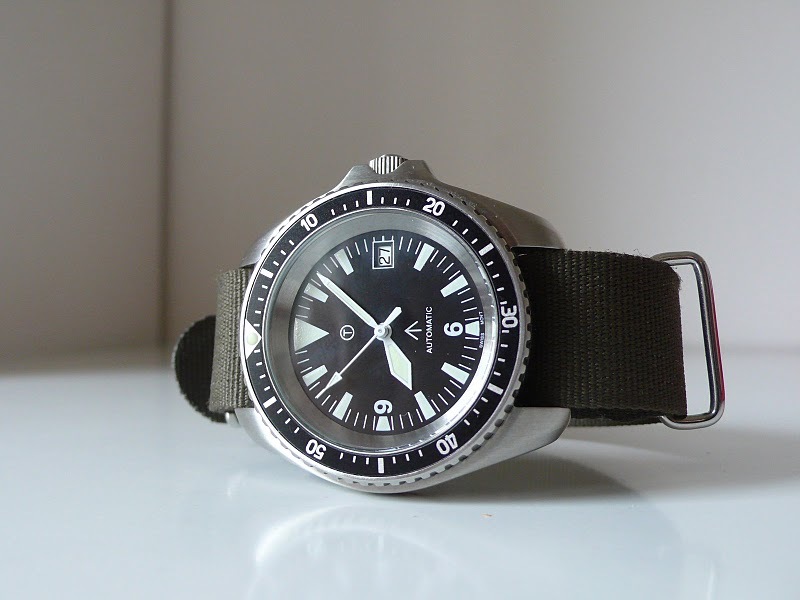 While surfing on military-styled watches sites, I often came across variants of a certain diving watch, all featuring the ETA 2824-2 and retailed between 200 and 300 euro. I eventually stumbled upon The Military Watch Mall on Alibaba, who seems to source these watches straight from the factory to sell them on eBay. I ordered the stainless steel bracelet model for less than 150 euro, and here are my thoughts after a few days. I have extensively search the Internet to find the origins of this design. From the 1960’s onward, half-a-dozen brands, have used this particular case design; namely Adura, CWC, Edma, Heuer, Jean Daumont, Le Forban and Nappey. My theory is that CWC was the first to replace the original dial design and drawing inspiration from the Omega Seamaster 300. Combined together, both elements give a very functional look to this watch. 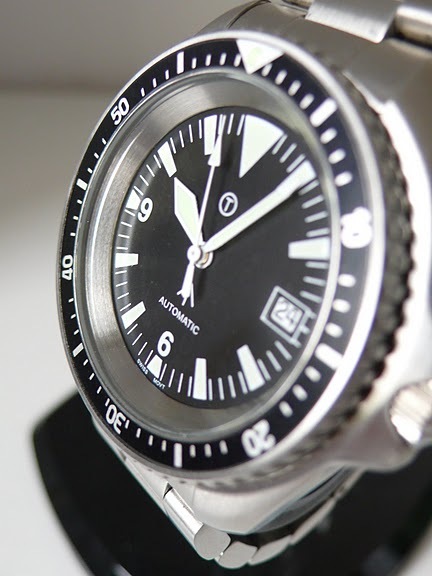 The accronym SBS is a reference to the CWC watches supplied to the British Special Boat Service. The overall design of the watch I purchased from the Military Watch Mall is very likely based on the CWC, and I noticed that all similar watches can be sorted out based on the shape of the crown shoulder protection. On the CWC and the MWC, the cut is straight and angled with two corners. The image below shows the difference between the CWC, the MWC and this sample (SBS), which has a curved cut. The case is in 316L stainless steel. Both back and crown are screwed-on, the crystal is sapphire and the unidirectional rotating bezel has minute markings. 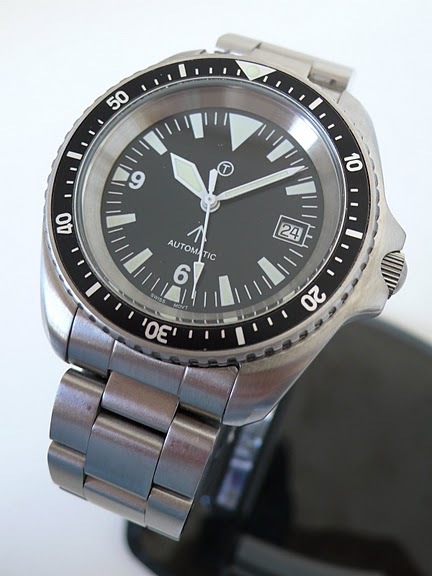 This watch is sold as resitant to 30 Bar, which would roughly be the same as 300 m of static immersion in sea water. The dial is black mat, with a white minute track and C3-coloured luminous material. The hands are painted white, with matching luminous colour. The crystal is flat, and as can be expected from sapphire, it bears little reflection. The SWISS MOVT. marking is there to remind us that albeit it houses a Swiss ETA 2824-2, the watch cannot be labelled as SWISS MADe since it is assembled in the Far-East. The case benefits from a nice optical illustion created by the bezel (shallower than the case) and the small dial aperture: the case has a base of 42 mm width for 5 mm of thickness. 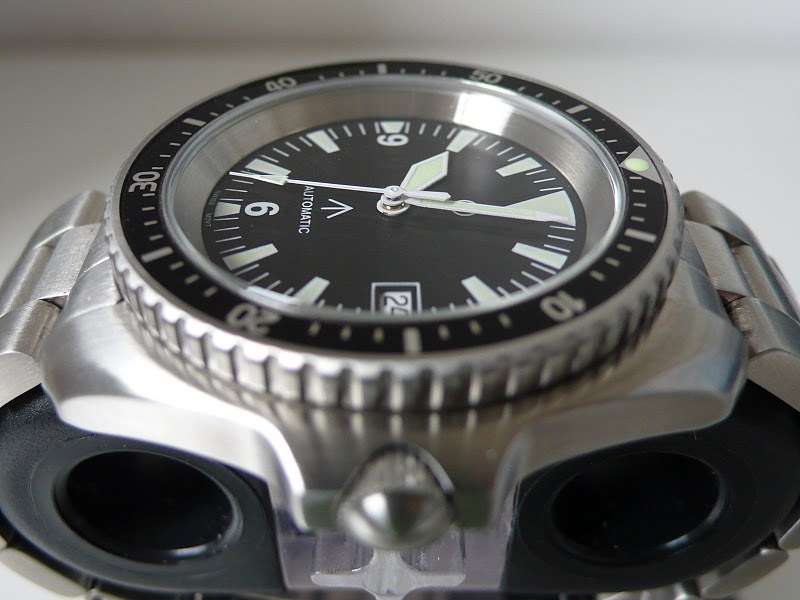 The bezel has a diameter of 39 mm for a thickness of 3 mm. There is an inner ring, reducing the visible dial surface to a circle of diameter 27 mm. This watch bears no trade mark whatsoever, as it appears to be a blank production from the very supplier. The case and dial are of very good make. 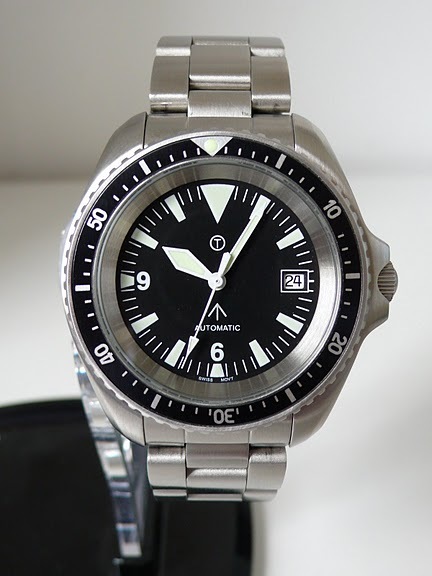 Borrowed from the Seamaster 300, the dial is well-balanced and extremely legible in tactical situations. The bezel clic sounds of average quality… but considering the price rance, it is acceptable. The Rolex Submariner-like bracelet is well-built, but the lung attachment is very tight: the central link located closest to the case rubs against it right between the lungs. The only part that really feels cheap is the folding clasp: a slightly thicker stainless steel sheet should have been used instead. The bezel features a protruding luminous dot, but it really looks vulnerable to scratches. Overall, this Kronos feels like a proper tool watch. I am not able to test if the water resistance compies with the ISO standards, but I think that for the budget, this is an excellend bang-around watch. This article was compiled thanks to the feedback on the French-speaking Chronomania forum. I have used one of these for scuba diving and they work very well. I have only had it down to about 40m however.They are solid but not too bulky and being cheap it doesn’t matter too much if they get a beating.